A lot of critics attack Disney’s 1979 sci-fi blockbuster The Black Hole on the basis of science. And while one level that’s understandable, it’s not terribly fair. For instance one critic called foul on the black hole being visible. And while it’s true that according to science they cannot be seen–you don’t see the black hole itself, but the reaction of objects in the range of its influence–can you imagine how viewers would have responded to an empty void? These days? It wouldn’t probably be such a big deal, but in 1979? Competing against Star Trek: The Motion Picture (which for my money had way too many plot elements in common with the Space: 1999 episode Voyager’s Return, but that’s another post) that had to couch it in terms that viewers could understand (and not openly mock, it goes without saying). Besides, when we’re talking about science, why is it movies based on Star Trek or the X-Men get a pass? For instance, the transporter from Star Trek (which breaks a person down into what I assume is data, and rebuilds them on the other end is pretty silly (scientists are working on such things right now though I’d have to ask if that’s because they were inspired by Star Trek, as opposed to vice versa) and let’s not even get started on the X-Men, characters that exist in a universe where a person can have the power to project beams of force from their eyes, or shape shift (which I could easier accept if it were as painful as altering your skeletal structure and flesh should be). So, under the circumstances, I have literally no issue with the way science was portrayed (which reminds me, I don’t hear enough about how the idea of cold fusion was butchered–which is being really, really charitable–in Star Trek: Into Darkness. At least The Black Hole took scientific principals and extrapolated in a logical (at the same time, fantastic) manner, as opposed to making up stuff out of whole cloth. They’re rumors that Disney has a remake in the works helmed by Joseph Kosinski (Tron: Legacy, Oblivion) that supposedly more science-based. And while I think that that would be an interesting interpretation, it doesn’t take away from the original, which was pretty remarkable in its own right. The US Cygnus was for a time displayed in the MOMA (Museum of Modern Art) and looking at it, it’s easy to see why. 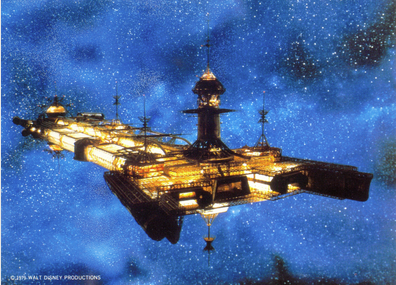 It’s easily one of the most complex–if not the most complex–spaceship designs ever made. Looking like a space bound cathedral–which wasn’t accidental–it’s a beautiful mass of girders that is as fantastic as it is unrealistic (there’s no way that such a complex design would be considered for an actual spaceship. but that’s actually part of what makes it so amazing. The filmmakers could have easily went for a more simplistic design, though I am glad that they didn’t). The clip above, which I like to call ‘The Hell Sequence’ is indicative of the problems the movie faced. It was a bizarre scene, and I imagine most people had no idea what it meant. For awhile I counted myself among them, though thinking about it recently I came to realize that it was a way for the crew to interpret the fantastic and unexplainable in human terms (earlier in the movie both Harry Booth (Ernest Borgnine) and Lt. Pizer (Joseph Bottoms) specifically make reference to the black hole being related to either Hell or the Devil, so it makes sense something remarkable painful–this pain may have been entirely on a mental level, though there’s no way of knowing for certain–and so beyond anything that a human has theretofore encountered would be described in such terms. During the voyage through “Hell,” a star appears, which as we get closer becomes a a crystalline cathedral–not unlike the Cygnus itself but leads to salvation, as opposed to death–when a woman suddenly appears. She’s clearly either moving or falling at great speed and appears almost Christ-like, and she leads the way to salvation. Why Kate? First off, she’s the only woman in the movie. Second off, she possessed ESP (extra-sensory projection), though I assume that this was not a natural ability, but an implant that enabled her to communicate with V.I.N.cent without actually being being present. It is this ESP that in a sense protects the crew from being driven mad by the forces that existed within the black hole because it needs to be kept in mind that that probe ship had the same shielding that the Cygnus itself had, which were proof against the incredible gravimetric forces it unleashed. But what would protect their minds? That’s where Kate McCrae (Yvette Mimieux) comes in. She wasn’t strong enough to stop the effects of the black hole on the psyches of the crew, but she was strong enough to shield them from the worse of its effects. And she was right, literally and figuratively; but what she didn’t know was that evil not only lives in our hearts, but in our minds, which is the one area that, despite being dead, Reinhardt and Maximilian reign supreme. Posted in actors, directors, Disney, Movies, My Two Cents.Tagged cold fusion, Dr. Hans Reinhardt, Ernest Borgnine, ESP, Harry Booth, Hell, Joseph Bottoms, Kate McCrae, Lt. Pizer, Maximilian Schell, Museum of Modern Art, Oblivion, Star Trek, The Black Hole, Tron: Legacy, USS Cygnus, X-Men, Yvette Mimieux.